Performing a hive split is not something that I do often. However, it is an important thing to know how to do successfully. An unsuccessful hive split with leave you with one of two things. 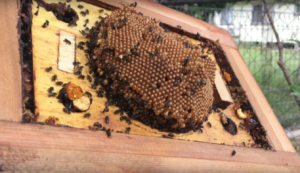 To prevent this from happening you need to understand about how the queen works in a hive and also how pests enter a hive and gain the upper hand over the bees. Here is a picture of a complete brood structure of Tetragonula Carbonaria. In the absence of a queen cell you will need to provide some advancing front material. Why provide advancing front? The simple answer is, a hive without a queen is no hive at all and will fail. The undamaged queen cells guarantee that both halves of the split will have a queen, yet if these are not available, the advancing front can provide this too. 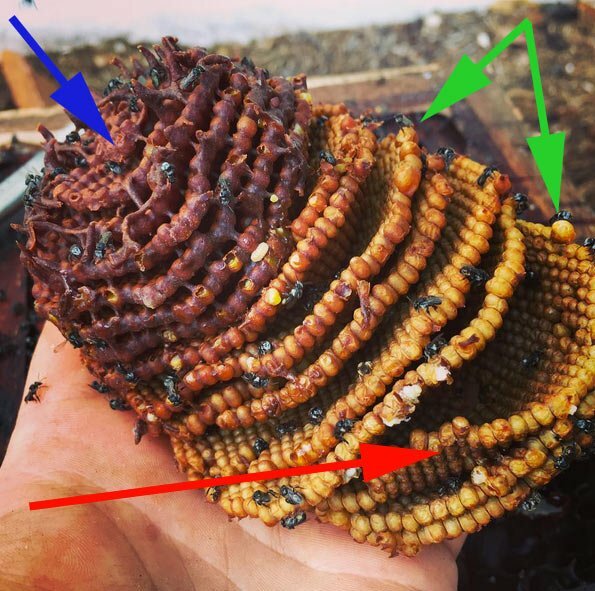 Contrary to some people’s belief, native bees can extend the walls of a freshly made cell and add more food to create a queen cell in the event of a queen being absent from a hive. This will become your queen. Watch the video on how I perform a split and I will explain about pests further down. After your split is completed the defense pheromones of the bees mixed with the smell of honey and pollen calls the attention of many ugly pests. These go to work laying their eggs in the cracks and joins of your native bee hive. The eggs turn into a tiny grub which crawls into your hive and feeds on the native bee stores. Using some of Deans syrphid defender or taping your box will help defend from encountering these. These enter the hive by distracting the guard bees for a split second and then circling around to enter the hive. Once in the hive they go to work laying eggs on the honey and pollen that is damaged. Mixed honey and pollen is their preference. 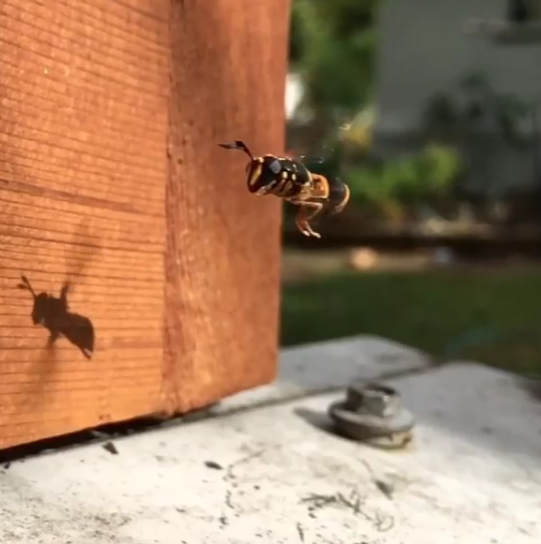 These flies release a pheromone that draws more flies to the hive. If you do not act fast these flies can destroy a healthy hive in a couple of days. Making sure you split is absolutely clean and reducing the size of the entrance hole post split are two good preventives. Deans Phorid fly defender really works to deter these guys a lot of testing was undertaken by me because these guys are such a problem where I live. These most commonly fly in on dusk to the smell of honey. While I class these as the least harmful to my native bees they are not to be underestimated. If your bee numbers are low they enter through cracks or the entrance of the hive and lay larva all over the nest structure. The maggots release a slime that contains a toxic formula for bees. By the time maggots are everywhere the bees are mostly all deceased. 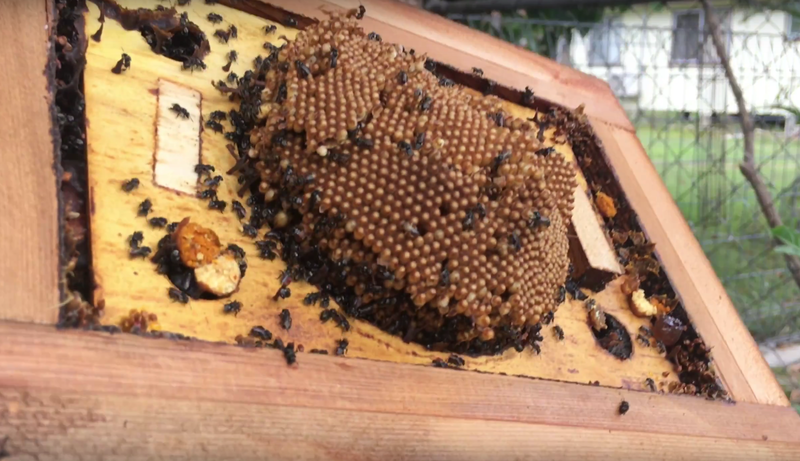 Native bees normally handle these guys fine on their own by dabbing them with resin. Again clean splits with minimal damage to the nest and a 3 day quarantine is my advice.